Dedicated: Vehicle runs solely on natural gas. Bi-Fuel: Vehicle can operate on natural gas as well as either conventional gasoline or diesel. Dual-Fuel: Vehicle combines natural gas as the main fuel with diesel fuel for ignition. 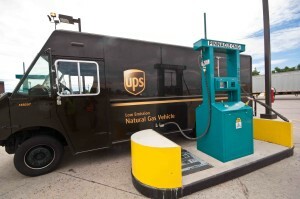 Generally speaking, natural gas is less expensive and more stable than diesel or petroleum, making NGVs particularly attractive to fleets that consume high amounts of fuel. The majority of natural gas is produced in the United States from sources such as gas or oil wells. In order to be utilized in a vehicle, natural gas must be stored onboard as either compressed gas or in a liquefied state. These two types of natural gas are known as compressed natural gas (CNG) or liquefied natural gas (LNG). CNG is optimal for use in light-, medium-, and heavy-duty vehicles, while LNG is most often used in heavy-duty vehicles. Renewable natural gas (RNG) can be produced from renewable sources such as decaying organic material found in livestock manure, landfills, and waste water. Anaerobic digestion and treatment procesess can convert these gases into vehicle-grade RNG. According to the Department of Energy, natural gas currently fuels over 100,000 vehicles in the United States. Natural gas offers many environmental and energy security benefits in comparison with traditional petroleum as a vehicle fuel. It produces significantly lower amounts of greenhouse gas emissions than gasoline and diesel. It is widely produced within the United States, thereby reducing our dependence on foreign oil.